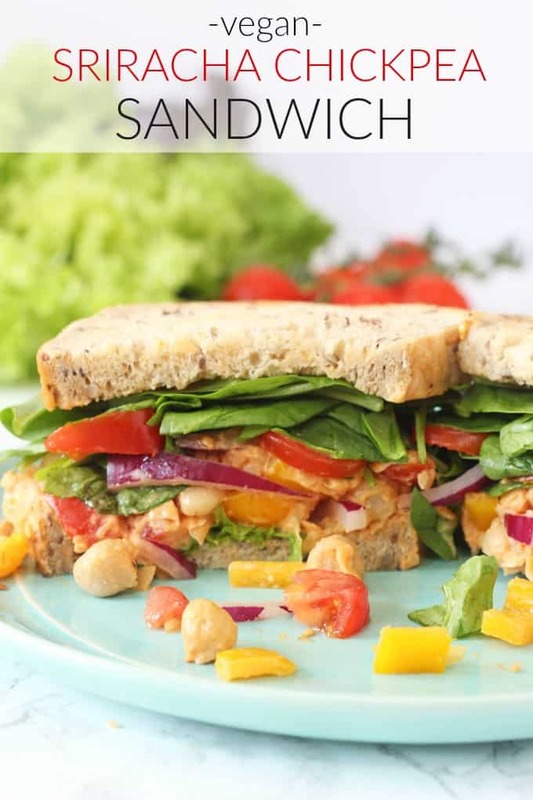 A delicious vegan sandwich packed with spicy sriracha chickpeas, lettuce, spinach, tomatoes and peppers. 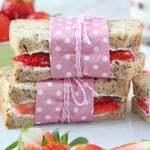 Perfect for a two minute healthy lunch for busy parents! I wrote a little personal post last week alongside the recipe for these Sesame Noodle Salmon Parcels all about how I am making an effort to look after myself a lot more health-wise. I won’t repeat myself again here so go check out that post if you want to read more but today’s recipe is basically another one of my “My Healthy Mama” recipes. On busy weekdays lunch is often a bit of a disaster for me. I often end up skipping it entirely, as I’m in such a rush to get my work finished before school and nursery pick. I then end up grabbing something massively unhealthy at 3pm when I am completely ravenous. Not good! 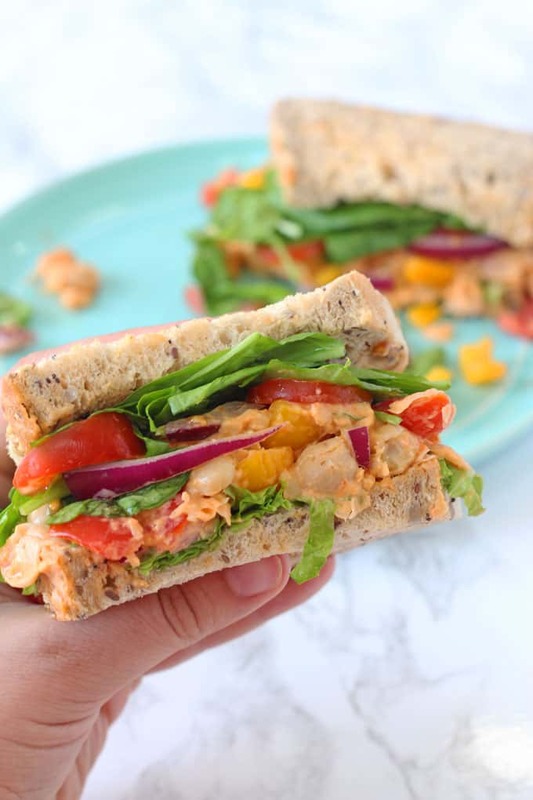 So in an effort to up my lunch game I made this really tasty Sriracha Chickpea Sandwich today. 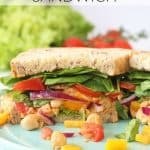 Loaded with spicy chickpeas, lettuce, spinach, tomatoes and peppers it’s packed full of protein and other veggie goodness! I used this delicious Sriracha Vegenaise to create a spicy sauce for the chickpeas but you can of course create your own with normal mayo and Sriracha mixed together. With the chickpeas, I mashed half and left the other half whole, which helped to give a lovely creamy texture to the sandwich but also still some bite from the whole chickpeas. All-in-all this sandwich was a big success as even my meat-loving husband absolutely loved it! 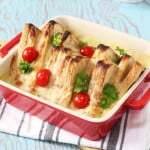 Way more tasty than a boring cheese or ham sandwich and super filling too. Winner! To stay up-to-date on all my daily eats don’t forget to follow My Healthy Mama on Instagram. 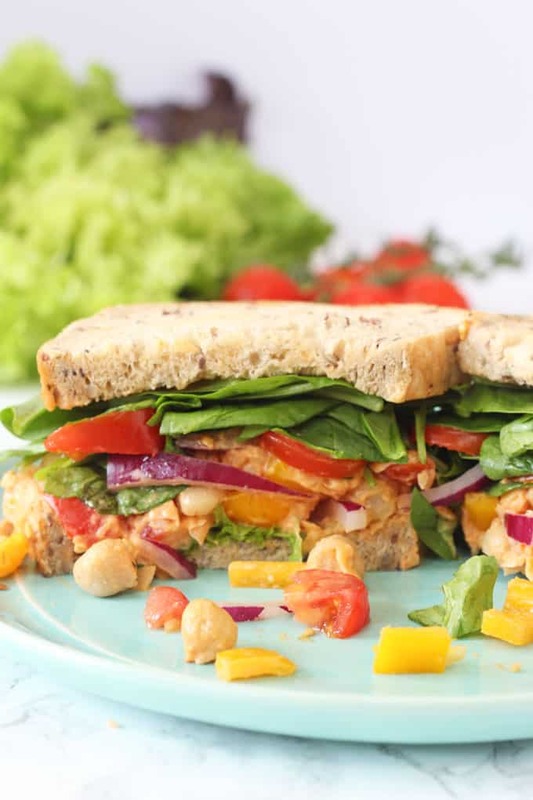 A delicious vegan sandwich packed with spicy sriracha chickpeas, lettuce, spinach, tomatoes and peppers. 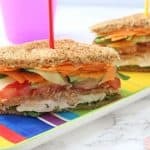 Perfect for a 2 minute healthy lunch for busy parents! Add the chickpeas to a bowl and roughly mash them (I tend to mash half the chickpeas and leave the other half whole). Add the Sriracha mayo and mix well. Chop the tomatoes, pepper and red onion as small or big as you like and mix in with the chickpeas. Season with salt and pepper. 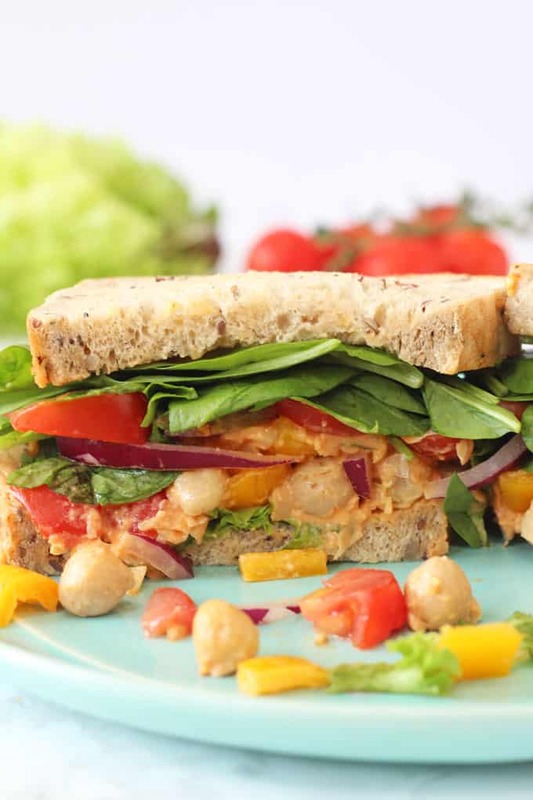 Make your sandwich by adding the lettuce, then the chickpea mixture and finally the spinach onto the slices of bread. Wow, this was so filling! Sriracha is a revelation to me and it gave it a really lovely kick. No more boring lunches for me!